Too often in day-to-day life, we’re overwhelmed with sensory distractions and can’t hear our own inner voice. Have you ever pondered to take a break from all the business? To have time for yourself? Connect with other like-minded people with daily yoga and life coaching? Then a retreat could be the answer! Let’s transition into 2019 with mindfulness. A time for you to reflect, create closure and open to the possibilities ahead to embrace the fullness of life. re-energise and motivate yourself into action. Your retreat environment should be harmonious with surroundings intent on diving in to connect and support physical, mental and spiritual growth. Most importantly, your retreat should foster an atmosphere of silence for listening where you can find peace and simplicity, encouraging mental integration. Having the space to spend time in silent reflection to contemplate on what moves the soul are the true foundations of a retreat. For true and ongoing spiritual growth, it’s important to make a few lasting resolutions to improve your daily life at home. 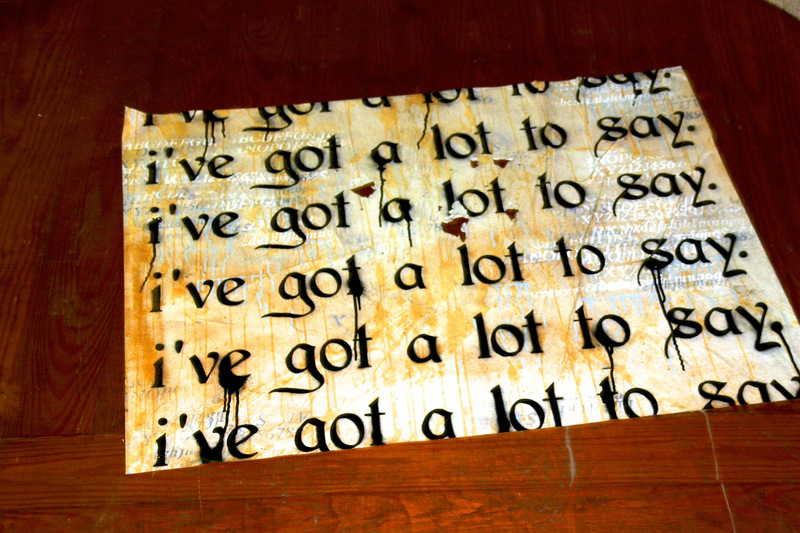 Be sure to write those down to remind yourself if you make a wrong turn. Most importantly, shake it off and begin again. Action with integrity will move you in the right direction. Every once in a while turn off your cell phone and unplug yourself from all technology. No one needs your attention more than yourself, everyone else can wait. This is a class where we introduce you to the Mysore Yoga Practice and its tools. 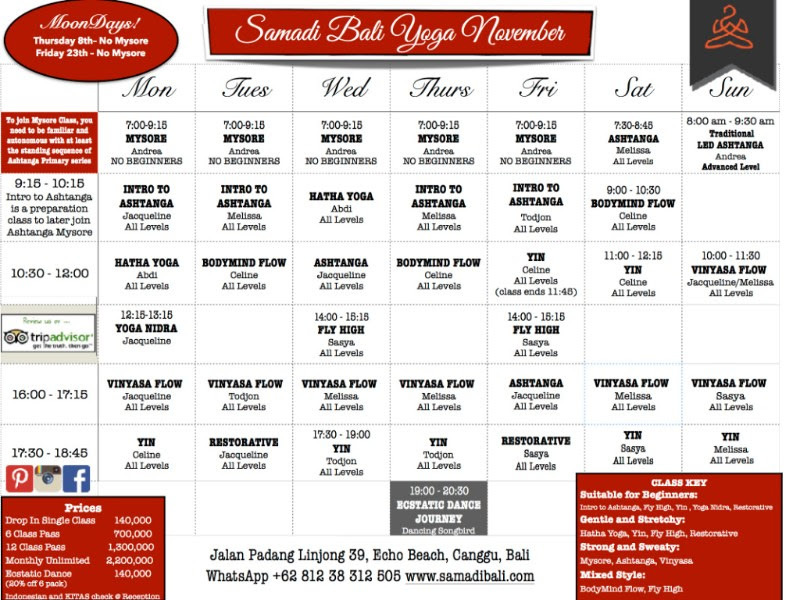 Beginners are required to commit to enough classes before they can participate in the Mysore classes in order to get a better understanding of the practice and its sequence. The idea is that you learn the standing sequence and can join the Mysore morning class becoming autonomous in your own self practice. In this 2-hour immersion, Ezriyah will guide through a transformational journey… from fear to clarity, from Scared to Sacred… You will be supported in identifying, expressing, transmuting and moving through the fears that have hindered your progression. You will leave with having experienced and incorporated powerful modalities to enable you to be more fully the love that you are by the increasing of your courage capacity. *Fear Release Ceremony: identifying, transmuting, and releasing of past hurts and limiting beliefs embedded in your mind, body and spirit. * Silent/Moving meditation to integrate the Ceremony and open up your body to higher vibration of love. *Alchemical Poetic immersion: an experience created for you to activate and embody your creative genius while immersing in vibration of love and harmony. Reservations and booking please call or WhatsApp +62 (0)812 3831 2505 or emailadmin@samadibali.com or visit Samadi Reception. 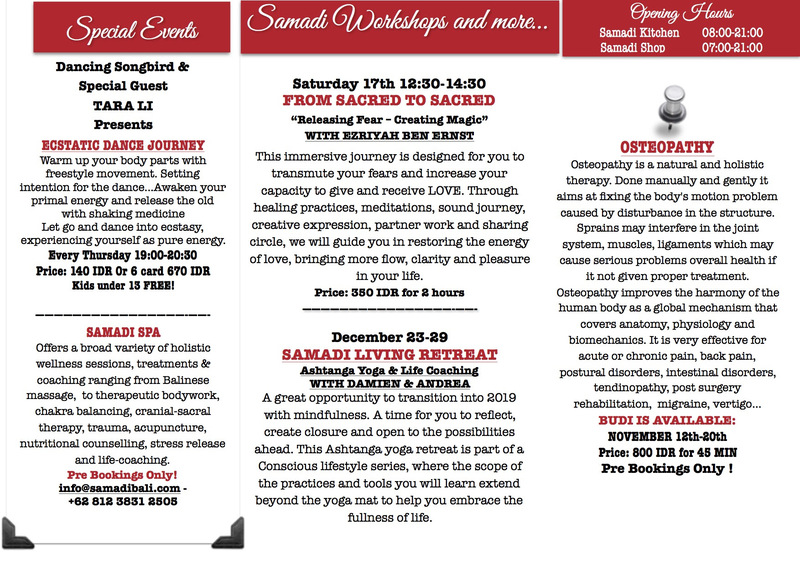 During these 4 day courses you will learn to perform a full body treatment lasting from ½ hour to 2 hours; to better appreciate the role and mechanic of your articulations; and enhance your adjusting & relating skills as yoga teacher. 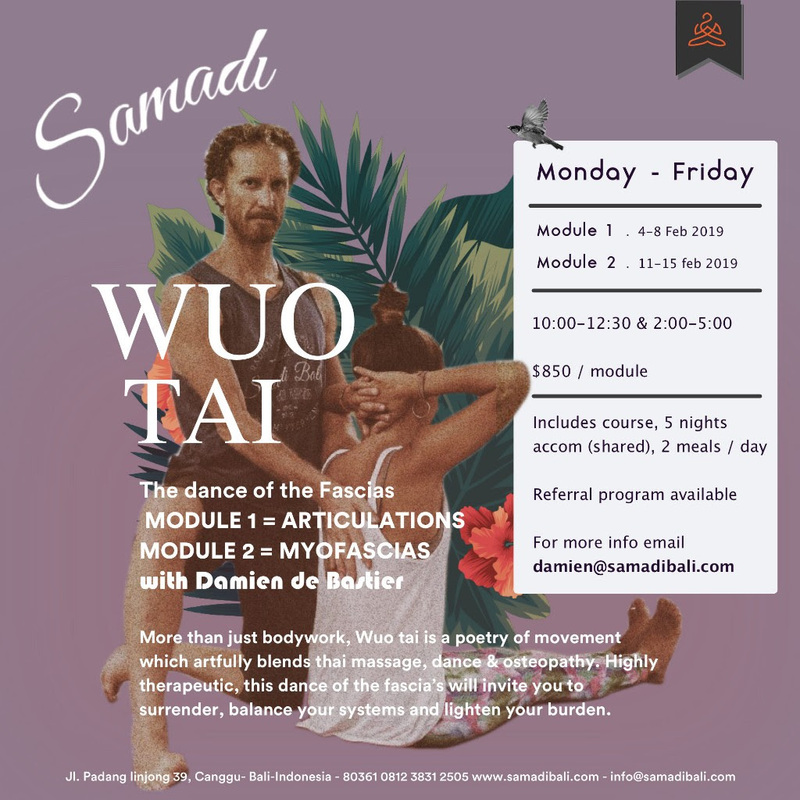 Wuo Tai is inspired by the elegant marriage of dance and Osteopathy. It doesn’t require any specific physical condition. It is practiced at any age and explores the vast variety of soothing body gestures. Wuo Tai is a new gymnastic for two which movements promote an awakening of consciousness and relationship. Wuo Tai brings flexibility, strength, agility, and balance. The magic of Wuo Tai is to simply discover that we receive what we give. Join us for a 3 day retreat and unique island experience. 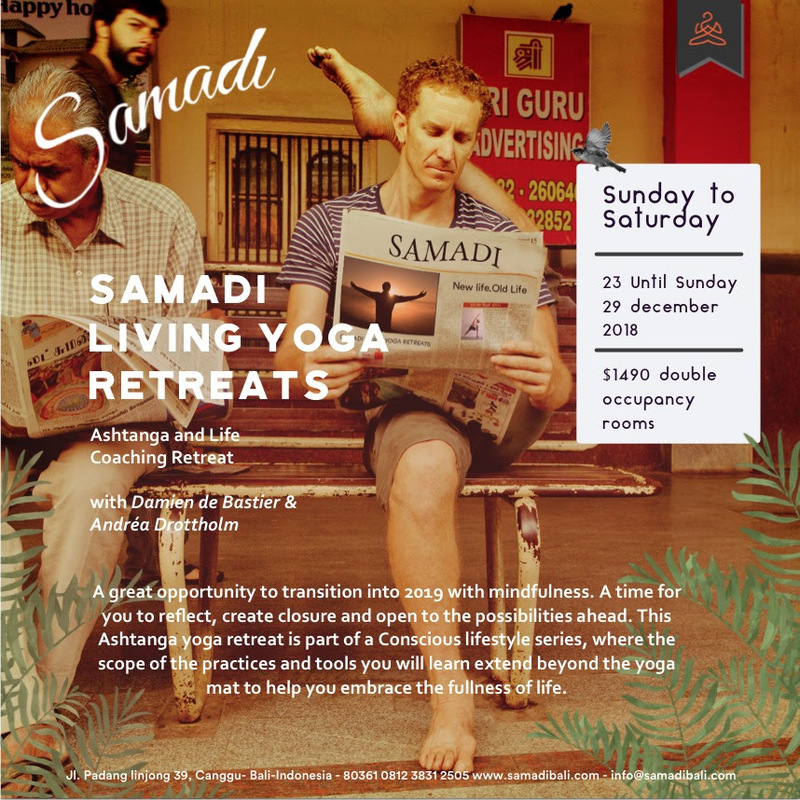 Dive deeper into your yoga practice, awaken your mind, body, spirit with our special healer and recharge your batteries while living the Samadi lifestyle. with beautiful people with plenty of time to relax! · 2 nights / 3 days in one of our beautiful designer bedrooms with rice field or pool view including air-conditioning, swimming pool, WIFI, and private bathroom and daily housekeeping. Osteopathy is available one week every month. 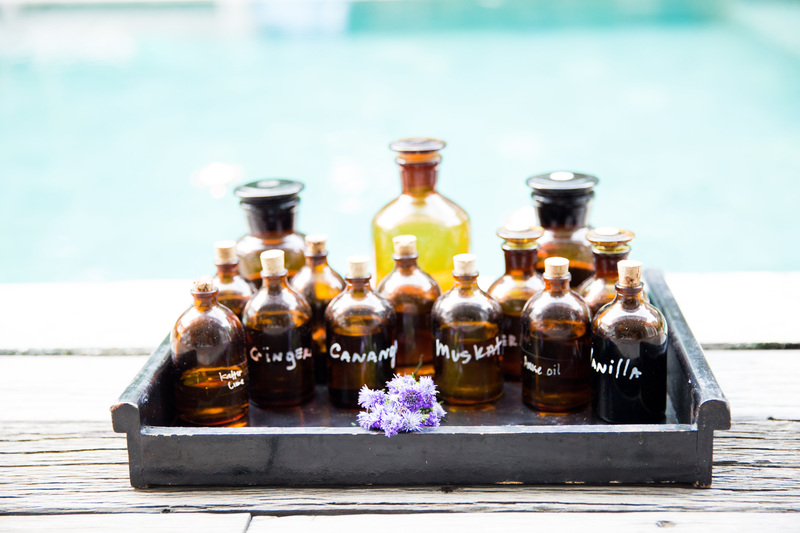 Spa related inquiries and bookings contact admin@samadibali.com or +62 (0)812 3831 2505 (also WhatsApp). Pre-bookings only.